Earlier we talked about eSk8s that ran up to (or past) 20 miles per battery charge. One of the downsides to those boards is their price: you are paying for that impressive mileage. A lot of these boards, however, were designed for specific uses and depended on rider styles. If you aren’t looking for a board that travels 20 miles, it doesn’t make sense to buy that board – even if it’s affordable. There’s also no reason to buy a “name brand” eSk8 when boards made by lesser-known brands perform just as well, often at fractions of the price. It’s similar to buying a laptop: if all you want is a laptop that can “do” word documents and easily browse the internet, why would you shell out $600 for a laptop that can edit 4K video footage? With that in mind, let’s look at electric skateboards that run ~15 miles on a battery charge. While this mileage is still impressive, the boards that can do this are more “well rounded” for general/leisurely use. Please remember that gravity plays an important in the total miles you can ride. What this means is this: when you ride up a hill, no matter how steep it is or how many inclination degrees there are, more battery will pump to the motor, zapping more juice just to reach the top of that hill. This means the battery expended more energy, and won’t be able to take you the full 15 miles. Yuneec (cute name, isn’t it?) 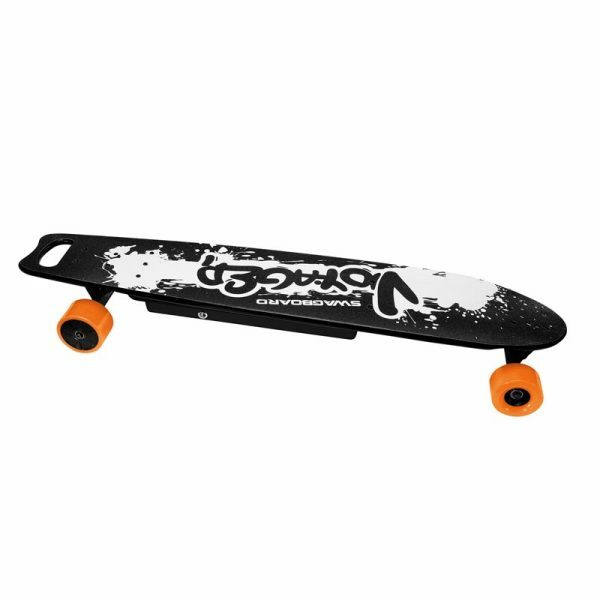 has two classes of their E-GO series: The Cruiser and E-GO2 Longboard. At ~22lbs., people who weigh <220lbs. will have no troubles riding this board, especially when going for the 12.5mph max speed. This weight carriage is thanks to the admittedly-heavier 8-layered Canadian maple material the deck is made from. What this single motor does for you is it takes you to a maximum speed of 16mph, and courses up to 16 miles on a single battery charge. Before we get to the total distance of this board, I feel like a salute is in order. Buffalo made their F electric skateboard with 4 layers of fiberglass AND 4 layers of bamboo. Quite simply, this board is durable and lightweight – considering. It has a single motor. This seems a bit disappointing… until you find out that it’s a 1200W motor. This is phenomenal, as most brands need two motors to reach that same amount of power. Buffalo makes the claim that this motor is so powerful, you can come to a complete stop when you’re riding downhill. For all this power, though, you can expect to travel a little over 15 miles. Which is not at all a distance to take lightly. With SLA batteries, the GT Powerboard (made by E-Glide) will take you as far as 15 miles on flat surfaces – thanks to its B & B EV batteries. 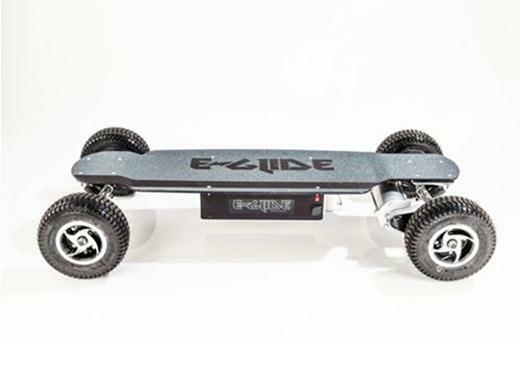 Even though E-Glide claims this board is made with “state of the art European electronics”, and can take you from 0-23mph in less than five seconds (thanks to its lightweight aluminum deck), it is not an all-terrain board and should not be ridden on uneven/grassy surfaces or plains. 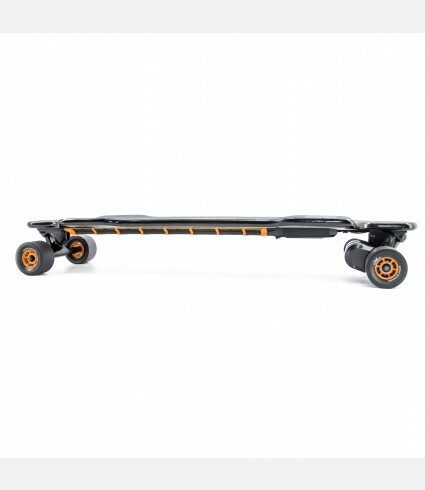 We’ve talked often about Swagtron’s Voyager 42” e-Longboard, and for good reason: this board is absolutely phenomenal. Not only can it carry up to 330lbs. (due to its 8-layer Canadian Maplewood and 2-layered bamboo deck, making it a great option for people who are on the heavier side), it can also speed up to 30mph maximum. Swagtron outfitted their Voyager eSk8 with dual 350W motors (700W total). At 42” long it weighs only 19 lbs, making it easy to carry. Koowheel designed a peculiar board when they made the D3M Longboard. They outfitted it with dual 350W brushless hub motors (700W) total. Not a lot of brands made the decision to put two powerful hub motors on their eSk8s – and I personally wonder why. Maybe this decision is why they’re listed as one of the best brands on the market right now. The D3M is also integrated with a Smartchip specifically designed to stop accidental acceleration and spontaneous/unintended braking. Plus, it’s fast. At nearly 28mph maximum, this is one of the fastest dual-motor boards your money can buy. The D3M weighs roughly 17 pounds and, surprisingly, can take you a little over 15 miles distance. These 6 brands and their boards were selected (from many) electric skateboards because, not only can they ride up to nearly 15 miles on a single charge… they are also constructed to last for a long time. These boards are strong, fast and were designed with riders’ enjoyment in mind. The brands listed here are all regarded as the “big dogs” of the electric transportation industry, and for good reason. If you’re looking to travel an even farther distance, don’t worry.